ReadySetz Magical 3D Play Scene Folds up When Kids are Done! I write about my 6-year-old granddaughter a lot, but for good reason. She tries out all of the toys that I receive! 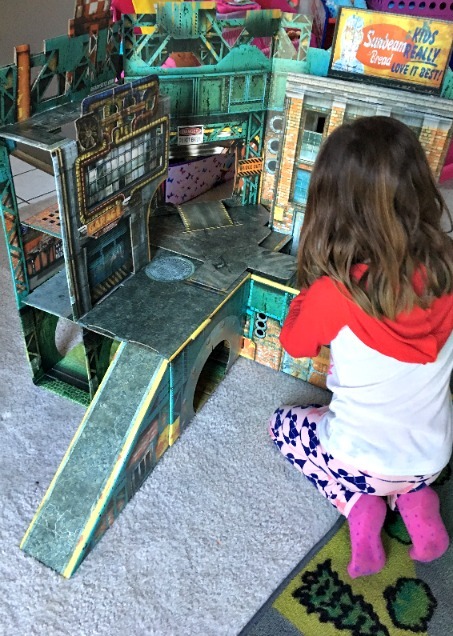 This little girl is used to playing with Barbie’s and dolls, so I wasn’t sure she would like the ReadySetz Urban Play Set. I was completely wrong. She loved the playset because it was fun, we (her mom and I), loved it because it folds up! Remember the days of playing with cardboard boxes? We could make cars or houses, whatever our imaginations wanted. The only problem was they would get ruined easily. 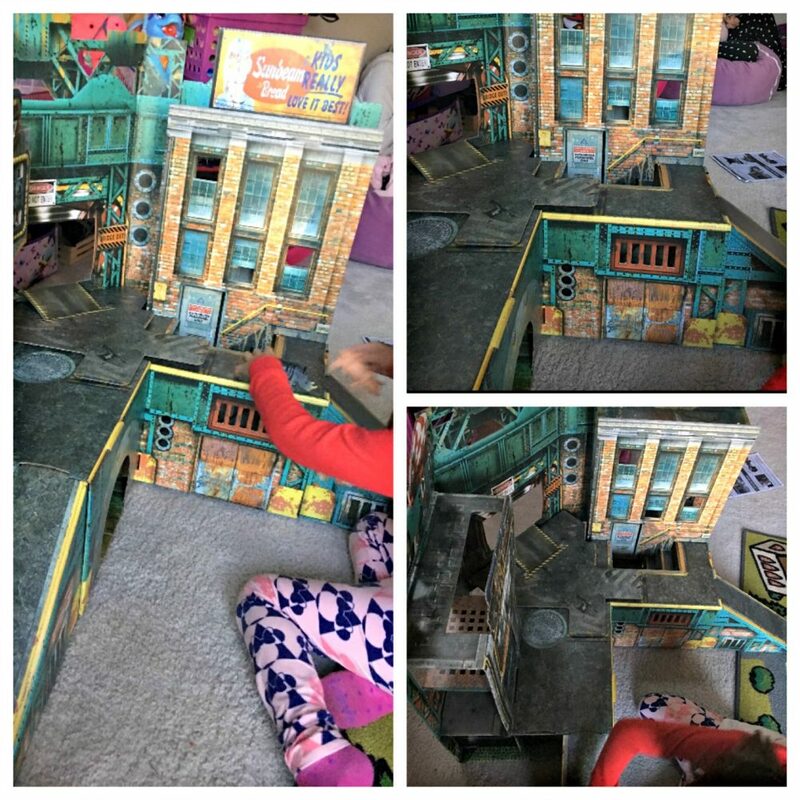 This ReadySetz Urban Play Set is made from a durable, cardboard-like recycled substance (not plastic!). As a matter of fact, it can hold up to 100 pounds without collapsing! I found that out by watching my 9-month-old granddaughter climbing on it. She didn’t break or bend it, and if she didn’t destroy it, not much will! So what does a little girl do with a fold-out playset like this? Well, we used little animal figurines and played hide-and-seek! There are doors that open, a helicopter pad, and even a garage door (that also opens). If you look at the bottom, there is a tunnel with pretend water. That is where the dolphin stayed most of the time while we were playing. Our imaginations were running wild! It’s wonderful to see a child creating their own play instead of staring at a tablet or phone. The ReadySetz playsets come in 2 sizes (full and half-size). The playset folds up like a book and was so easy that my granddaughter did it by herself. I’m so impressed at how simple they have made it. As a matter of fact, it folds flat for easy storage. So how would your child play with this setup? The possibilities are endless! They could use cars (there are ramps! ), dolls, animal figures, or whatever they have laying around. That is what I love about these sets, kids can do whatever they want! They can use their imaginations and go wherever it will take them. Previous Post: « A Flexible Racetrack That Glows!